What will it take to get your ecommerce business in front of one million people? Do you have any idea how to make that happen? If you don’t, you are in the right place! On this episode of The Amazing Seller, you’ll hear from Scott as he explains how they were able to reach one million people on Facebook for FREE. You read that right; it’s not a typo! Don’t put this episode on the back burner; this is one you can’t afford to miss. Have pen a paper ready; you are going to need it! Make sure to put yourself out there! If you want to reach one million people on Facebook like Scott’s brand did, you’ve got to be willing to put yourself out there. What does it look like to put yourself out there? Start creating content! You don’t have to have all the right equipment or the perfect message; you just have to start creating content. Don’t worry, you’ll learn and adapt your approach as you go, but you’ll never reach the people you want to reach if you don’t take a step into the unknown. Learn more about creating content by listening to this helpful episode of The Amazing Seller! Be open to new partnerships. Did you know that one of the best ways to increase your reach is by connecting with other brands and influencers? It’s true! If you can build up content and engagement for your brand, you’ll likely attract other brands as Scott did. If you think about it, it is similar to brands hiring a celebrity spokesperson. While it is smart to be cautious, be open to a mutually beneficial partnership that would help both brands. 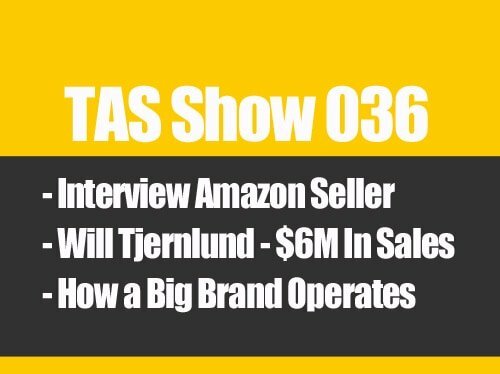 To hear what this type of partnership looks like, make sure to listen to this episode of The Amazing Seller, you don’t want to miss it! Don’t forget to build your email list. If you’ve been around the TAS community for very long, you know that Scott is passionate about helping sellers like you realize their need to build an email list. Have you done it yet? If not, what are you waiting for? As your business grows and gets increasingly dependent on Facebook, YouTube, Instagram, and the rest to get your message out, what would happen if one of those channels fails? Would your revenue stream suffer a significant setback? What if you could turn to an asset like an email list to connect directly with your customers? You can! Learn more about the value of creating and maintaining robust engagement with your email list by listening to this episode of The Amazing Seller. [0:03] Scott’s introduction to this episode of the podcast! [3:50] Put yourself out there on the marketplace. [7:50] How turning on Ads can help you bring in revenue. [14:45] Five ways increased traffic grows your brand. [17:45] Why you should check out the Ecom Business Formula Book. [19:20] Build your email list! [21:00] Closing thoughts from Scott. …people on Facebook in under two weeks for free by the way. These results are just crazy, mind boggling. But it’s something that I want to share with you because it happened because we took action and you guys hear me talk a lot about taking action. And then the opportunities will start to show themselves. Well this is exactly what happened and a perfect example of what I’m going to share with you guys. And in the last episode 656, I talked all about the five different ways to get traffic. This here happened because we went through and used some of those traffic getting techniques if you will. Because we went and we showed up in the marketplace. We were being looked at as a leader in a sense or a guide or a resource like I’ve always said. And again, this is things that your competition is probably not doing. And I said this in that episode, I’m going to say it in this one. Take a few minutes and go through your competitors on Amazon. Try to look them up on Facebook, try to look them up on the internet. Go and search for a website. Try to find a website that they’ve built. Try to see if they have a social media presence. See if they have a YouTube channel. Do some of this research to see if they are even doing any of this external stuff. And the reason why I say that is because well if they are not, that’s a great opportunity for you. And I’d be willing to bet that most are not. Most are trying to just go and launch products on Amazon and get ranked and get sales. And I know people right now that have built seven figure plus businesses doing just that. [00:02:04] Scott: But I also know that those people and I know that because I have people in my Inner Circle that I work with and they are at that level and they are like but I need to do this external stuff. I am nervous that Amazon is going to shut my account down, or whatever. So that’s why we’re building these external channels and these external assets. Now, if you’re listening to this and you’re like, ‘Scott, I’m not there yet. I want to figure out how to build a future proof brand,’ or even just take my existing and build a future proof brand through that or through that process, I’d definitely recommend you checking out my playbook as I call it or the guide, the ten-step formula. Go to ecommbizbook.com. Right there you will see that I have created a guide, a 52-page guide that will walk you through looking at your market through these different lenses in a sense. Where you’re going to be able to validate your market to really be able to see if you can even do this in your current business. So I’d definitely say check out ecommbizbook.com. And that will take you through that entire process, that validation process but also where you can see these different opportunities to be able to build out these external assets. So definitely check out ecommbizbook.com even if you’re just starting or if you’re up and running, it will definitely be helpful. So let’s get back to how we reached one million people on Facebook for free by the way. And how this even just came about. Now number one this came about because we put ourselves out there in the marketplace. And I’ve said this over and over again. You want to be the guide or the resource in your market. [00:04:02] Scott: So again let’s take the bass fishermen for an example or the Kayak bass fishermen. Let’s say that that’s the market that I’m going after and I’m publishing content, I’m in my Kayak, I’m showing accessories that I’m using in my kayak. But I’m also teaching how to go out there and win your next kayak bass fishermen tournament, whatever. Like I’m just constantly talking about that, but I’m also using a certain product, a certain brand that makes a kayak. And they noticed this. And they go, ‘Hey, we noticed that you are out there and you’re serving the market and you’re doing a really good job at it. Is there any way…’ This is literally what happened. ‘Is there any way that we could have you create a post, and it doesn’t even have to be where it’s pushing our product 100% but can we have you create a post and we’ll put $5,000 behind it? Like for real. Like can you do that? Would you be open to that?’ So at first I had a kind of a look and it was my partner that got approached with this. And then they brought it to me and I’m like all right, let’s think about this. Why are they doing this? What is in it for them? And then we just started to kind of back and forth having conversations and really it is them taking their marketing budget, their advertising budget and putting it into influencers versus them just running a generic ad. So that tells you anything about influencers or people that are leading in a market. And that are getting attention in a market, brands, and this is a very established brand, brands will be willing. Now what they ended up doing is having us create two different posts and then from there they started to push the traffic. So let me give you some numbers here. [00:06:01] Scott: The very first post, and one of these is still running. This one here I believe has finished. This one here reached, this is reach now. This doesn’t mean that everyone seen it but you’ll see by some of the shares, and some of the clicks and all that stuff, that’s how many people actually touched it. But it was 301,000 organic. So that’s how many people seen it organically. 851,451 reached. So that’s a paid reach. That’s how many news feeds that we got into in our marketplace. So 301,378 organic. That means that showed up there for free. And then 851,451 that showed up because of paid. Now, here’s the cool thing. That’s just reach. That means that’s how many news feeds we actually landed in. From that, we had 15,100 shares of that post. That’s insane. And then we had 36,125 clicks on the link and guess where that link went by the way. It went to a blog post. And on that blog post there was mentions of affiliate products, there was mentions of our products, there was mentions of our opt in offer, our email opt in offer. There was a pop up on the side that offered a digital guide, a digital book for our market. So all of that, so you would say okay well that probably that increased revenue, and it did. Just from Ad thrive. Ad Thrive is a network of … And I’ve talked about this before, it’s you get enough traffic, they will let you use their network of advertisers. [00:08:03] Scott: Again, it’s all targeted. It’s relevant to the person on your blog. And from there we are making a good deal of money just from ads running on our site doesn’t necessarily mean it’s our product but it’s by impressions. And so just from that… So just think about that. 36,000. That means how many people clicked a link in that post that led them somewhere else. 15,100 shares. We’ve had a lot smaller posts that have gotten attention, that have had 100 shares. I’m ecstatic with 100 shares. Because one share could be in a group of 400,000 people. So 15,100 shares. That means our post is shared in other people’s either pages or groups or just one on ones. But it’s 15,000. Now here’s the other cool thing, comments. Over 2,000 comments. 2,200 to be exact, right now as the time of recording this. Crazy. These are crazy numbers. Now the smaller one, the one that’s still running right now that started running after the fact, this is one here is not as good. I’m being kind of sarcastic. It isn’t as good but I would have taken this as far as the first one. So 66,901 organic reach. The paid reach is 400,566 and then it’s had 22,785 clicks, 3,000 shares. Less shares. And then 330 comments, and that one is still running. So combined that’s over a million people that it’s reached in their feed. A million. [00:10:06] Scott: And then if you combined the shares, that’s 18,000 shares. If you tally up the clicks so far, we’re 36,000/22,000 so that’s 58,000. It’s crazy. Sorry about the little bark there. Got Mazy in the office today and I’ve got some people outside doing some work. She’s just letting them know that we’re here recording. So crazy stuff. But again, how did this happen? How did this happen? Well, it happened because we were posting content on our own page. We were posting content on our own blog. We were getting attention from our own assets and our own resources. But it started because we built an email list over 20 months ago and we communicated with that audience. We showed up on Facebook on a regular basis, delivered value and a major player in our market. We’re not going to sell kayaks by the way. We’re not going to sell them. But they want us to endorse them in a sense by publishing content and that’s what we’ve been doing. Now, here’s another thing that happened after the fact. Which I was going to share this a little bit later but I’ll share it now. They also reached out and wanted to know if we wanted to write five different posts and they would pay us $3,000 to do it. Now, at first I’m like, that’s a lot of work for three grand but again it’s a way for us to create content. It’s our content. They just want us to create that it’s more tailored towards them. We’re still going to get the effect off traffic and people to our site. And then they are also going to endorse us more and they might even put more money behind those posts. [00:12:00] Scott: So at first I was like eh, it’s a lot of work for that. But what’s the benefits of it? So again, it’s just another opportunity that happened because we’re showing up in the marketplace. And again, this does not mean it’s going to happen for you. I never would have planned this. I never would have expected this. But what I can say is this. This is a direct effect. This is what I call the take action effect by the way. This is the actual effect from something that we did without even intending for this to happen but it opened a door. It created awareness to another brand, another influencer to say you know what, maybe we should connect with these people. They reached out to us. So again, it comes down to starting with knowing who your market is? What do they want? What do they need? Being a resource, being a guide to that market and show up on a regular basis. Show up on a regular basis. Now here’s the other thing. When you get stuff like this happening, when we go to sell this brand which we’ve talked about selling here publicly, and we are probably going to do that if the number is right. This is a huge asset. This alignment with this other company is a huge alignment. These numbers are a huge alignment. Having the email list is a great asset. Like having the blog traffic over 250,000 impressions per month now. Over 100 unique visitors, having that is another asset. Having the ability to drive people wherever you want is an asset. And that’s valuable to an investor, so these things that we’re doing, we’re building over time. Doesn’t happen all at once. But we started by knowing the market, what do they want, what do they need. And then again as you’re going through this and you’re learning more and you’re going to adapt. You’re going to figure out what else they want. [00:14:02] Scott: And maybe another spin on something. Or maybe a spinoff of another market or submarket. This actually is a submarket inside of our main market. This particular company. So yes it’s aligned but it’s not like fishing. It’s not bass fishing. It’s Kayak bass fishing. Kayaks built for bass fishermen. That’s what it would be like. But we can still sell bass fishing stuff to a little bit more of a broader. And then we can also jump out of that a little bit and go into fly fishing if we want to. So doesn’t have to be 100% always staying there but we’re in that niche market. So really, really important. So I’ve got five things we gained from this and I wanted to cover them. So what did we gain? Number one, more engagements to our Facebook page. We’ve increased likes, we’ve increased commenting and shares and on all of our other stuff, not just on this one post. Because once someone comes in and they start to kind of look around they start to, some people binge a little bit, they also get directed to an opt in, they get directed to the blog, so they start getting more of part of our world, part of our brand. We increase the likes, the shares, the brand awareness. We’re starting to show up more places. So number two, traffic to the blog. They seen our ad, we got more email opt ins, we sold more through affiliates. All of that stuff. We’ve sold more on Amazon. All that because of this. So that’s number two. That’s what we gained. Number three, our blog was shared and it helped our SEO. I didn’t look but I guarantee that there are links now pointing directly over to our blog post from all of those shares from other people and now that’s also going to show Google that we have something that’s valuable that people are paying attention to and that helps our SEO, our search engine optimization. [00:16:04] Scott: It allows us to generate more traffic to our blog just from Google. So that’s another benefit. Number four, we have the ability to target every single person that has touched our Facebook post. And what I mean by that is if someone has liked it, we can retarget them. If someone has shared it, we can retarget them. If someone has commented we can retarget them. If someone clicked we can retarget them. All of this is how we are building custom audiences. This is on a little bit of big scale now which is crazy, like even if all we can do is target, retarget just the people that shared it we would be able to target 18,000. If we only could go after the people that had what was the number on the clicks, if all we could do is say, ‘All right Facebook, anyone that’s clicked on our ad, we want to be able to retarget those people. We could do that. That would be over 50,000 people. Just from that. So it’s like a custom audience. People that raise their hand. So that’s the other cool thing with this here. Now, number five relationships built with strong partners. And again, I shared with you, now they want to pay $3,000 for us to write some posts. We can probably negotiate that and say, ‘I’ll tell you what, it’s $1,000 a post.’ And they’d probably do it. We haven’t gotten that far yet, I’ll keep you posted on that. But again, relationships build a strong business because these are things that we can lean on later. These are assets as well. So don’t underestimate your network and the people that you can align yourself with. Don’t think that everyone has a competitor. Do not do that. So those are the five different things that we gained. Now, the bottom line is this, content equals traffic, equals brand growth. [00:18:01] Scott: And that’s what I believe that people need to understand when you’re building out your business and really figuring out that long term play. This is a long-term play. This is something that does take time but it’s worth the time. And I want to kind of throw a little shameless plug there. If you want to go through your business or if you haven’t started this is the right place to start, but if you have started, if you want to take your business through the validation process and really map out who are your potential partners? Where can you be creating this content? Where should you create this content? Where should you be building your external assets? Can you build external assets? All of those questions will be answered inside of the guide that I talked about in the beginning of this show. And that can be found at ecommbizbook.com. Again, that’s ecommbizbook.com. Check it out, yes you’ll buy me a cup of coffee but I do believe it will be best investment, small investment like cup of coffee investment you’ll make because it does definitely break things down. So you can look at your business differently and also plan for the future and create that road map that you can follow. But I did want to give you some final thoughts though. It’s if you’re not building that email list, you need to start that. But again, you got to know if your market even lends itself to that. Or if you’re even able to do that. That’s where that book would come in handy. But really, it comes down to when we first started this. To be honest with you, anything that I’ve ever started after I learned that this is so important I’ve always started with an email list. I delivered value, built an email list, communicate. And then always mentioned products or services or things that are helpful that would help them along the way. That’s it. It’s really, really that simple. So the email list, creating blog content, Facebook page content, then follow up on that content that you’re creating and then you’re going to rinse and repeat like that is it. [00:20:04] Scott: Content equals traffic equals brand growth. That is it. Again, like I said, validating is huge. You need to validate that this is even possible because you don’t want to be like, ‘Oh, this is a great product. I want to sell this thing.’ Then you do that and then you’re like wait a minute here, it’s not really a market that I can expand in, there’s really not any other products that go with this, although it’s said it was selling great so that’s why I wanted to sell this thing. It’s the wrong way to go about it. You want to go about it as far as what market you’re serving? Can you find three to five products that you can potentially sell to that same customer and then from there can build awareness and external traffic and attention in that market by you showing up and being the guide. And it’s not you, it’s someone else that can do it. But you just need to understand you want to be a valuable asset to the market. And it doesn’t have to be a massive market. And then start building the email list, letting people know about your content and then rinse and repeat. That is it. And cool things like this could happen. Not saying they’re going to, but they could. And this here is a perfect example that we never ever expected and then these numbers are just blowing me away. This is like crazy, crazy numbers. So guys, to wrap this up and again, hopefully this got you guys excited about getting out there and creating your own content and really building out your external channels and assets and all that stuff, you definitely, definitely want to do that. Just want to remind you guys, the show notes can be found at theamazingseller.com/657. And then also one more little call to action here if you have not grabbed your copy of the E-comm Business Formula book, the guide, the playbook, whatever you want to all it, head over to ecommbizbook.com and grab your copy. I’d recommend you print that out and then that way there you have something tangible that you can actually notes and go through that entire process. All right guys, so that’s it. That’s going to wrap up. As always, I’m here for you, I believe in you and I’m rooting for you. But you have to, you have to… Come on say it with me, say it loud, say it proud, “Take action.” Have an awesome, amazing day and I’ll see you right back here on the next episode. NEW To The Blog and Podcast?